For most people, there are only two times in their lives when most of the people they love are all together at the same time and place: Their wedding and their funeral. While they may not be able to appreciate the latter, they absolutely should make their wedding the happiest and most memorable experience of their lives. And one of the best ways to do that is to bring people together — literally. People who are married will often tell young couples planning their wedding that their wedding day is going to seem to go by very, very quickly. There is simply so much to do, so many people to see, and so much excitement and festivities that before you know it the whole day is going to be over. Regardless of how hard you try, there just aren’t enough minutes in the day to spend as much time with everybody at your wedding that you would like. But one of the best ways for couples to improve their chances and make their celebration both happier and safer is to charter luxury tour buses to transport their guests to and from the church and reception hall. Weddings are social events. And couples aren’t the only ones seeing people they haven’t seen in a long time. Friends, neighbors, co-workers, classmates, and others all come together to celebrate the couple’s love for one another. But when everybody is driving independently, that together time is kept to just a few hours at the reception hall. Wedding charters change all that by maximizing the amount of time your guests spend with one another. Plus, they offer the added benefit of not requiring people to drive — especially after celebrating. 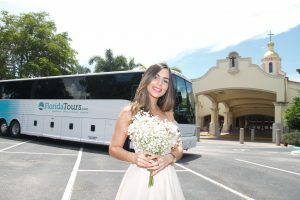 If you want to remember your wedding day, spend more time with your guests, and keep everybody both happier and safer, then consider adding a wedding charter from FloridaTours.com to your plans for your big day.